Gold and silver have long been known to be excellent investments for the preparedness minded. Buying though, listen to this podcast episode with Craig Hill of Hill and Vaugh Precious Metals. Before buying though, listen to this podcast episode with Craig Hill of Hill and Vaugh Precious Metals. Craig will walk give you the facts of what you need to know to make a smart investment in your future. Precious metals (monetary metals) are gold and silver. It wasn’t until modern times that some people began to downplay the importance of precious metals. Why Should Preppers Consider Gold and Silver as Part of their Preparedness? Gold and silver are a great way to protect yourself against the decline of the dollar. In 1964, it took $19,000 in paper dollars to purchase the average U.S. home. However, today, in 2017, it will take $250,000 in paper dollars to buy the same average U.S. home. The reason it takes so many more paper dollars to buy the average U.S. home is that of the devaluation of the dollar. However, while the dollar has devalued, silver and gold have maintained their value. Unfortunately, the devaluation of the dollar is likely to go on. Therefore, as part of your prepping budget, you should consider gold and silver in your prepping portfolio. Why Should Someone Buy Gold or Silver Over the Other? If you’re able, it’s best to diversify and buy both. Although, if you can only afford to buy one, then you should buy silver. Should buying only silver be the course of action you decide upon, it will make you much more secure. You will be more secure because silver is much easier to use for small day to day transactions. Also, should you lose silver during a day, it will be much less costly than losing gold. For example, it is a lot better to lose two silver coins as opposed to two gold coins. What is the Gold-Silver Ratio? The gold-silver ration is defined as the number of ounces of silver it takes to purchase one ounce of gold. Typically, when the gold-silver ratio is high, silver outperforms gold in the next cycle. Sign up to receive your free PDF copy of "Trading the Gold and Silver Ratio" by Craig Hill. What Should You Do When Investing in Gold and Silver? If you’re investing in gold and silver, you should diversify. Diversification does not just mean buying both gold and silver. It means investing in various types of gold and silver. It is essential when investing, to avoid high premiums. Avoiding high premiums will get your more precious metals for the dollars you spend. One way to avoid high premiums is to contact Craig Hill at Hill and Vaughn Precious Metals. Craig is excellent and helping the average person understand precious metals. He will offer you great advice to help ensure you are as prepared as possible when it comes to purchasing your gold and silver. When investing, try to focus on easily to recognize silver such as pre-1965 silver U.S. coins. These coins are known the world over. They are also commonly known to have a 95% silver content. Therefore, they will be easy to trade and use as currency. What Size of Gold or Silver Ingots are Best for Trading? First, it’s good to remember that the best metals are the ones trading at the lowest premium. 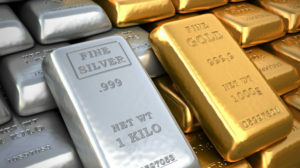 Right now, the type of precious metal that is trading at the lowest premiums are 95% silver, also known as junk silver. Junk silver includes U.S. quarters, dimes and half dollars minted before 1965. Should I Buy Collectible Coins (Numismatics)? Buying collector coins is an individual choice. However, collector coins usually have very high premiums.Additionally, collectible coins are only worth the high premiums to a collector who values the coin for its collectability. Simply put, should you need to use your silver in a major society impacting event, very few people, if any, will care that your silver is a shiny, collectible coin. Additionally, collectible coins are only worth the high premiums to a collector who values the coin for its collectability. Simply put, should you need to use your silver during a major society altering event, what are the odds people will collect coins for their artistic and collectible value.Therefore, paying high premiums on collectibles now reduces the amount of money you have to buy gold and silver with. This then means you’ll have less gold and silver to spend should you need it down the road. Therefore, paying high premiums on collectibles now reduces the amount of money you have to buy gold and silver with. This then means you’ll have less gold and silver to spend should you need it down the road. What Will Happen with Gold and Silver If a Collapse Occurs? Unfortunately, gold and silver will not do much during the early stages of a financial collapse or other society altering scenario. Later though, as is usually the case, the economy will begin to reestablish itself. As the economy comes back, gold and silver are very likely to be part of that movement. After all, gold and silver have historically always reasserted themselves as a form of money following significant economic and societal shifts. If you have any other thoughts or questions on gold & silver, please leave a comment below. Just to be clear and transparent, the Mind4Survival has an affiliate agreement with Hill and Vaugh Precious Metals. I do receive a small percentage of the sale from any purchases you make through this site, or as a result of the podcast episode.